I added two new pages to cmse201.com. The first was information about how to get help if you’re physically sick. I then showed the class the page on mental health. We care about you. So our first priority is to make sure your bodies and your minds are taken care of. To that end, we put the information for mental health front and center on the course website. My mom was diagnosed with bipolar disorder when she was about 26. If any of you happen to know Carrie Fisher—Princess Leia from Star Wars—my mom’s bipolar disorder is very very similar to Carrie’s. When I grew up, my mom would periodically have acute manic episodes, and she would need to be hospitalized. That became a part of my life. When I was in graduate school in my late 20s, I was diagnosed with severe clinical depression and generalized anxiety disorder. I learned I wasn’t alone. A large number of graduate students are diagnosed with mental disorders during graduate school, and that’s no accident. In part it’s a reflection of the structural problems inherent in graduate school. If I had, say, a broken leg, it would be visible to you. You might look at the boot around my foot and think “oh, my dad had one of those after his skiing accident.” But mental disorders don’t make themselves visible like that, even though they can be very painful and, at their worst, limiting. I go to therapy and take medications to help me manage my disorders. But, getting diagnosed also formed a lens of looking at life. It helped me understand things that happened to me when I was younger. And, it’s helped me understand that the feelings I have that “I’m a piece of garbage not worth anything” aren’t my fault. Those are depression. If it weren’t for therapy and medication, I would not be here right now. And, I apologize for getting that serious, but it’s true. If I hadn’t had access to these resources, I wouldn’t be here. That’s why I want all of you to know that we care about you, and there’s help. You may not need it now. It’s possible you may never have a need to look at this webpage. But as students, every single one of you is entitled to counseling help. I’m also being honest about this because I’m trying to reduce the stigma around it. You don’t need to feel like you have a problem to seek counseling. I think plenty of people benefit from therapy, regardless of their mental state. It can be extremely helpful to have someone who isn’t your friend, who isn’t related to you, who can see you and your life in ways you may not see it. Someone who can help. If you’re having an emergency, you can always dial 911. If it’s during business hours, counseling has walk-in hours for crisis handling. Like I said, many of you may never look at this webpage again, or feel that you need to. But you might know someone who does need help. And sometimes things can get bad, and people who need help aren’t able to do the thing they need to do to get it. So if someone you know needs it, you know who to call and where to go. And you know where to bring them if they can’t go alone. All the services offered are completely confidential and private. So, again, please know that we care about you. You can always come talk to me at office hours, or by appointment. My office is a safe space. And if you want to talk to someone else, the number is right here. I know not many courses would spend this much time talking about this. Probably not many courses would put the info on the course homepage, at the same level as the syllabus. But I think this is so important, so that’s why I did it. Thanks for listening. There was no easy way to transition from that topic to the next on my agenda, but I tried. Before we got into programming in earnest, I wanted to talk briefly about several women who were instrumental in what we were about to do. 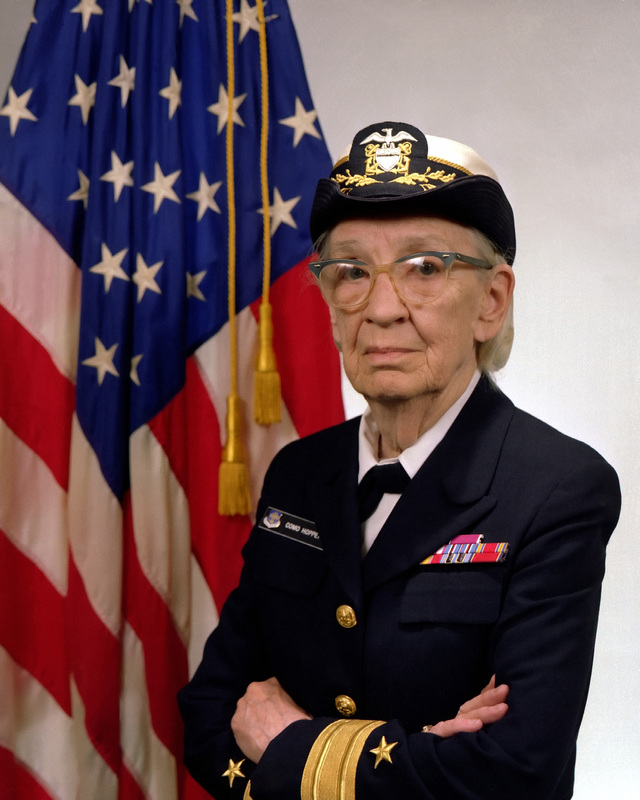 I think I started by discussing Grace Murray Hopper, who was an ultimate badass as far as I’m concerned. She was so instrumental that after her mandatory retirement, the US Navy created a position for her so she could keep working. It was Hopper who pushed against the then-unpopular idea that we should write in human-readable code; we shouldn’t be programming in machine code. So, it’s thanks to her that we have compilers. And, it’s thanks to her that what we’re about to do uses English, and we’re not still manipulating switches and dials on registers. I also told the class that I strongly recommend they see the film Hidden Figures, which tells the story of three black women who were instrumental to getting us to space in the US Space Race. I stressed that they suffered a kind of double-discrimination, being both black and female at a time when neither were viewed as equal. I told them how brilliant those women were, and how all three of them were real, living, breathing people. Then, we got on with the remainder of the class. Then, I move through the following list, again saying “put your hand down if this applies to you”. Play games competitively (chess, magic the gathering)? Still 1 hand up. OK. I’m asking this because all of you have some experiential basis for doing things like drills, where you do the same thing over and over again. Maybe it’s an end zone drill in ultimate frisbee, and maybe it’s musical scales. But the point is that you’ve all experienced having to focus on one thing over and over, even if it seems slightly removed from the main activity. Most music isn’t scales, and yet musicians practice scales every day. Why? Because they give us practice in moving between notes, so that when we actually play that becomes almost automatic. Same thing with an End Zone drill. Most of an Ultimate Frisbee game doesn’t happen at the End Zone. But you practice it so that when you are near the End Zone, it’s almost automatic and you move fluidly into it. As we learn programming, you may find we’re asking you to do the same small things over and over again. And, when we ask you to do that, it’s just like those other drills. It’s so that when we come face to face with more complex problems, you’ll be able to do certain things almost automatically. I introduced the concept of a “development environment”, which I told the students we would “come back to later”. Take about 5-10 minutes to start messing around with these. Try some ways to get the bulb to light. In your notebooks, record what your setup was to get the bulb to light. But, also record setups where you thought the bulb should light, but it didn’t. That one activity usually provides enough starting material for the entire semester. And, to be clear, I’m definitely not the inventor of it. About the only thing I think I added was emphasizing that they pay attention to configurations that they think ought to work, but don’t. what the hell does [block X] do? how do I make something happen over and over again? I put the pen down, but I don’t see anything. WTF? My choice of language is deliberate: “kick the tires” and “what the hell does X do?” are my way of trying to motivate a particular kind of skepticism. I don’t just want them to be inquisitive, I want them to get in there and start smacking (virtual) parts, taking nothing for granted. If it’s not clear what something does, that very well may be the designer’s fault. Treat it as such until you get an answer. While they worked, I told them I would be working too. So, I hooked my computer to the projector and live-coded on the screen while they were coding on their respective computers. A few minutes in I scribbled some things on the board and got their attention. I had drawn (I think) a circle, a stair-step line, a diagonal line, a triangle, and a square. When I had their attention I mentioned that if they were looking for something to focus on, they could try creating these shapes in their own environments. I tried to start with questions they had. Several had looked up at my livecoding during the exploration session, so I started talking about my code. That allowed me to bring up ideas like: How can you change a pen color by 10. That kind of doesn’t make sense. It does makes sense to say set pen color to RED. It doesn’t seem obvious that you could do RED + 10. So that’s kind of weird. That’s when I realized my code had a repeat block in it, which also made me realize D’s code did not. So, to make a circle D was pressing the green flag repeatedly until his sprite got back to its starting point. How can we copy and paste scratch code? What does defining your own block do? Why define your block when you can just copy and paste the code? I talked about my dissertation work and how this is still an open problem? How do people get convinced abstraction is worthwhile?